How Does Gluten-Free Beer Rate? Toleration Ale, Redbridge Gluten Free Sorghum Beer, New Planet Gluten Free Beer, St Peter’s Sorgham Beer, Bard’s Sorghum Malt Beer, New Grist Beer, and Green’s Gluten Free Dubbel Dark Ale. By Aaron Swaney, Herald Writer Via Everett Washington Herald. Throughout our marriage, my wife, Erin, and I have enjoyed a few pints of beer. In her old restaurant job, it was necessary for her to visit breweries and try different kinds of beers. We became fast fans of Boundary Bay Brewery, Chuckanut Brewery, Elysian Brewery and others. Name a brewery in the Puget Sound region and we most likely tried their beer. As her husband — and fellow taste-tester — it was bliss. Then she developed a gluten problem. Since most beers are brewed using wheat and barley, an intolerance to gluten is an intolerance to beer. The party was over. What I didn’t know is that a burgeoning market in the beer industry is the brewing of gluten-free beer. With an increase in the number of people with celiac disease and other disorders that cause gluten intolerance, gluten-free beer has been taking up more and more shelf space in the beer cooler. 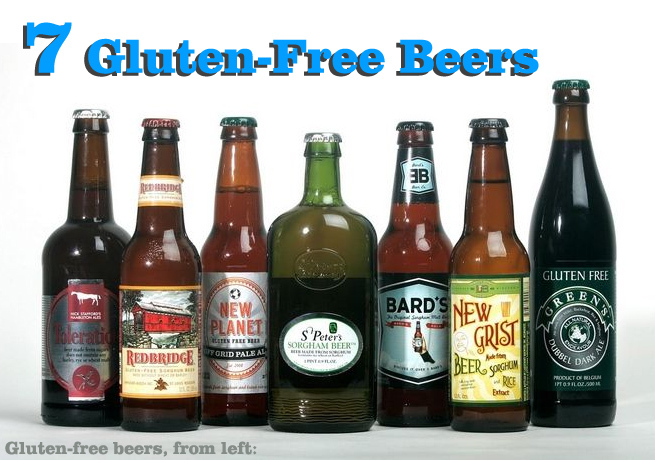 Gluten-free options lack depth compared to regular beer, and sorghum, often the leading ingredient in gluten-free beer, gives it a distinct flavor and finish. Some beers try to mask it with malts, while others do away with sorghum entirely, using corn, rice and sugars instead. 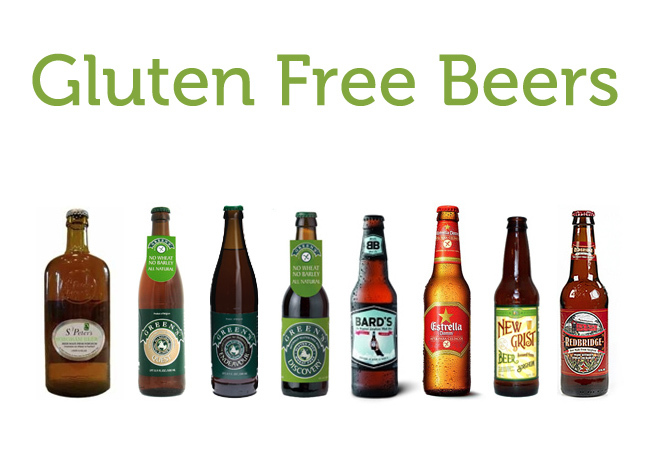 Recently I gathered all the gluten-free beers I could get my hands on and had my wife and our family friend Kit Hansen, who is celiac, review them. Here’s their verdict. Review: Anheuser-Busch’s take on a gluten-free beer is a basic American-style lager made from sorghum. This is definitely a clean beer with solid body and nice, subtle finish; the lack of a real sorghum bitter finish got it a thumbs up from the group. And though Kit said he could taste the Anheuser-Busch in it, this isn’t a Bud Light clone. Review: There just isn’t a lot to New Grist, Lakewood Brewery’s take on a gluten-free beer. It has a very light body and is eminently forgettable. In fact, Erin compared it to a very light, carbonated sake. Review: Made from malted sorghum, Bards is strong up front, with notes of caramel and fruit. But, unlike most gluten-free beers that have a distinctly bitter finish, Bards has really no finish. Overall with a solid malt backbone and a nice body, Bards is a respectable gluten-free beer. Ingredients: All three use millet, buckwheat, rice, sorghum, hops and yeast. Review: The Dubbel Dark Ale has a slight sorghum finish, but it is sweet up front and passes nicely for a Belgian-style dubbel. The Tripel Blonde Ale has notes of fruit up front and has the characteristic mouthfeel of a true tripel. But the best Green’s offering is the Amber Ale. Medium-bodied with notes of caramel, Green’s Amber Ale doesn’t have much of the sorghum finish and is the most balanced of the three. Ingredients: Challenger, Liberty and Cascade hops, top-fermenting yeast and specially prepared sugars. Review: This offering from Nick Stafford’s Hambleton Ales in England didn’t taste much like beer. More like a slightly hoppy barleywine. It had an aroma of dates and figs and was very sweet, but it had almost no carbonation. Erin compared it to a port. Ingredients: All three use sorghum, hops and yeast; Pale Ale also uses brown rice extract, molasses; Raspberry Ale also uses corn extract, natural Oregon raspberry puree, orange peel; Lightly Ale also uses corn extract, orange peel. Review: The star of this Boulder, Colo., brewery is Off the Grid Pale Ale. With a malty backbone and hoppy finish, it was hard to tell it was a gluten-free beer. Kit, who hasn’t had a real beer for four years, was blown away by how much it reminded him of a true pale ale. The Tread Lightly Ale is a very light beer with a distinct sorghum finish, and the 3R Raspberry Ale is a very carbonated, light ale that is reminiscent of a raspberry cider. Review: If you don’t like European lagers, you will not like this beer. It starts very bitter and has a distinct grassy aroma. It seemed to get better after it had been opened for a little while and was definitely a beer that paired well with food. This entry was posted in Beer, Beverages, Cooking, Culture, News and tagged Beer, drinks, Everett, gluten free beer on July 27, 2011 by glutenfreepdx. We Portlanders have things pretty good, even those of us who have to (or choose to) subscribe to a gluten-free diet. As our website testifies, the options for gluten-free food are great. When it comes to drinks, Portland also shines. Aside from wine, saké and whiskey bars, there are excellent cocktail bars and taverns in the Portland city limits. If you didn’t know it already, Belmont Station is a great resource for gluten-free beer, also. This excellent little shop now resides on SE Stark street, and it’s variety is impressive for gluten-free beer drinkers, not to mention all of those ‘normal’ beer drinkers. Belmont Station is a showcase for the best and most legendary beers from Oregon and beyond. Over 1000 beers have been carefully chosen, religiously rotated, and properly stored under UV-filtered light in order to maintain the freshest selection of beer in the Portland Metro area. We strive to fulfill customer requests and supply our neighbors with their beer of choice, whether it’s a six pack of domestic lager or some obscure Belgian ales. If you have questions regarding beer availability or special orders please click HERE. Please note that due to importation and distribution laws we are limited in what we can legally carry, but if it’s available in Oregon we’ll gladly order some for you. While beer has always been our raison d’etre, it’s far from the only beverage in the building. We also carry Portland’s most extensive collection of cider and mead (honey wine), as well as a small, carefully chosen selection of wine and sake. Visit them to check out their big selection and talk to someone who is really knowledgeable about their inventory. They’re located at 4500 SE Stark Street Portland, OR 97215. 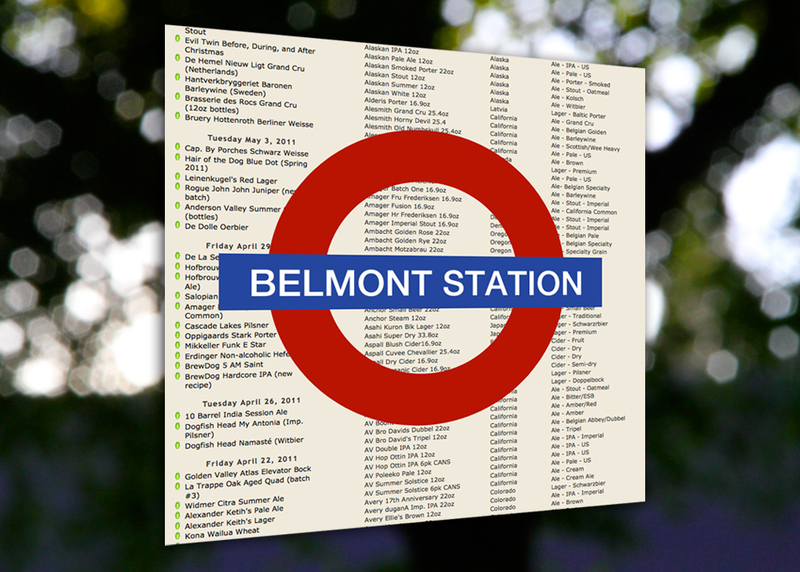 Their Twitter account (@belmontstation) will give you updates on the many beers they stock, though make sure to ask them if you have something special you’d like them to special order. The current selection of gluten-free beers at Belmont Station. This entry was posted in Beer, Culture, Health, Reviews and tagged Beer, beer portland, Belmont Station, Belmont Station Portland, Estrella, gluten-free beer portland, New Grist, Redbridge on May 24, 2011 by glutenfreepdx. Well, it took me a few weeks since I blogged about this beer before I actually picked it up and tried it. Available in four-packs at Belmont Station for about $8.50, it’s a pricey beer. But the claim of ‘best gluten-free beer in the world’ is worthy of investigation. Well, I’ve gotta admit, it’s really damn good! I’ll not try to wax philosophical on the flavor notes, but this beer seems to be very well balanced, and doesn’t have any metallic or strange aftertaste, the way some GF beers do. Truth be told, it’s been a while since I’ve had regular ‘ol beer, so I wouldn’t be able to compare Estrella Damm Daura to another well-known brand, but chances are, you’re going to like this. This entry was posted in Beer, Beverages, Culture, Health and tagged Beer, Daura, Estrella Damm DAURA, Product reviews, reviews on April 1, 2011 by glutenfreepdx. 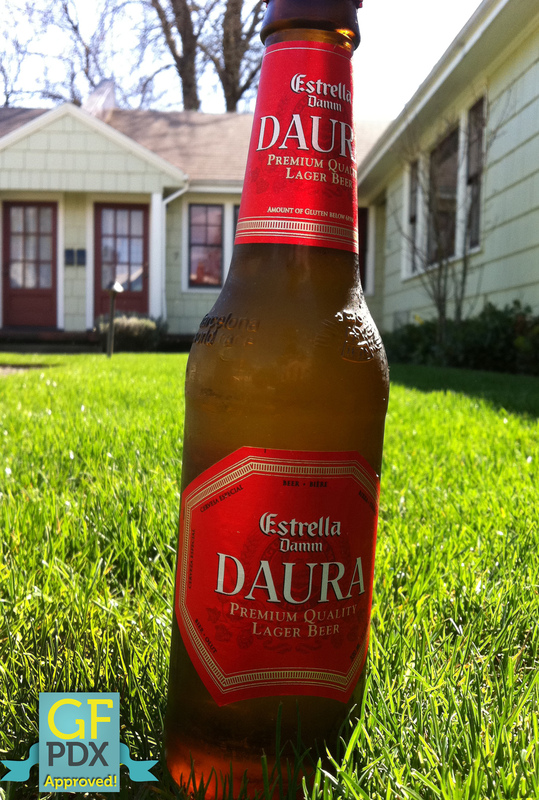 Estrella Damm DAURA…the best Gluten-Free beer in the world? Estrella Damm Daura, many consider to be the very best GF beer! Where to buy this beer? It happens to be available at Portland’s own Belmont Station, whoo! I will be checking it out very soon. Like, this evening! 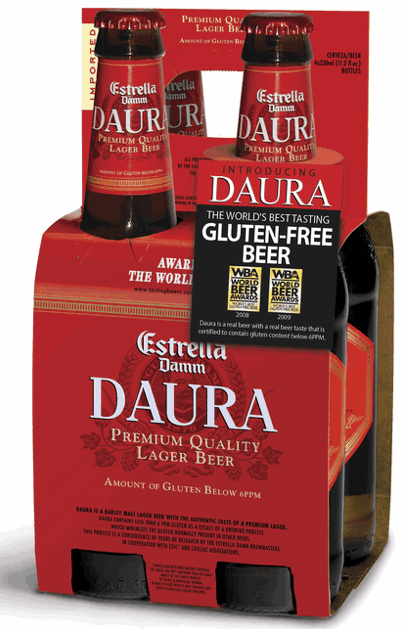 DAURA, which was launched in Spain in 2006 and is now available in 12 countries worldwide, is the first of its kind within the gluten-free beer category. Unlike other gluten-free options, which use sorghum as a substitute for wheat or grain, DAURA uses barley-malt to provide the “real beer taste.” A proprietary brewing process strips the gluten protein from the barely malt, leaving only the “real beer” taste. Because the gluten protein has been stripped away, DAURA’s gluten content level is less than 6 parts per million (ppm), far below the 20 ppm required for gluten free products, according to the Codex Alimentarious, the international food and drinks standard set by the World Health Organization and the United Nations Food and Agriculture Organization. DAURA is the result of a four-year investigative research project between the Estrella Damm brew masters, the Gluten Unit of the Centre of Research of the Spanish Ministry of Education and Science and various celiac associations. 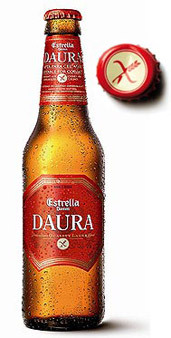 DAURA is a two-time winner (2008 and 2009) of the “Best Gluten-Free Beer” at the annual World Beer Awards. Celiac’s Disease (CD) is an allergy to the gluten protein, which is commonly found in wheat and other grain products (pasta, bread, pizza). More than 3.2 million people in the US are officially diagnosed with CD. And studies indicate that as many as 1 in 133 Americans have a form of CD. There is no cure, only avoidance and dietary changes. DAURA (5.4% ABV) is available at select on-premise accounts and in 4-packs (suggested retail price $7.99) in national off-premise accounts such as Whole Foods, Publix, Harris Teeter, Total Wine & Spirits and BevMo. Damm is nowadays one of the biggest beverage companies in Spain. The company has seven beverage production and bottling plants across the country. In line with the diversification strategy initiated a few years ago, the Group bases its activity around three main areas: Drinks, Finance, and Logistics and New Economics. Beer accounts for the largest proportion of the group’s business. This structure gives Damm, more than 130 years after its birth, a successful combination of modern and traditional values. In 2004, in its pursuit of sustained growth and consolidation in the market, the Damm Group agreed on a strategic plan for 2004-2010. The plan comprised industrial investments of 241 million euros, the fundamental objective of which were to enhance and streamline the production capacity and develop the logistics installations. Execution of this plan has enabled the company to double the production capacity of the factory at El Prat de Llobregat in Barcelona to 5 million hectolitres and turn it into one of the most modern plants in Europe. Similarly, the company has comprehensively invested in creating a large logistics centre of over 228,000 sq m at the ZAL industrial park, which is adjacent to the factory at El Prat de Llobregat. This entry was posted in Beer, Beverages, Culture, Health, News, Science and tagged alcohol, Beer, beer that is gluten free, Belmont, Belmont Station, best beer, booze, Daura, drinks, Estrella, Estrella Damm, Estrella Damm DAURA, gluten free beer, Gluten free Portland, great beer, great gluten free beer, portland, Portland Gluten Free, Spain, Spanish on March 7, 2011 by glutenfreepdx.